What's the best part of patch 8.2 you've seen so far? Never having to ride that freaking water strider again! Never again! Die you accursed water bug! Ahem. I may not like having to use the Water Strider mounts and as such I may be excited for patch 8.2 and the coming of mount equipment so that any mount can be a water mount. 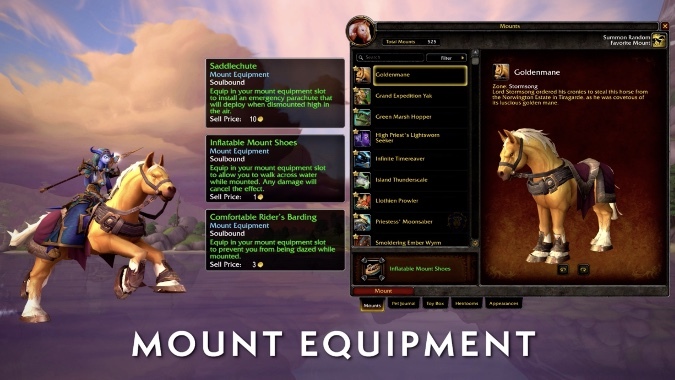 Because I’ve said from the beginning I’ve hated that for most classes (Shamans and Death Knights aside) those mounts are practically required use before you get flying unlocked in a particular zone. I went and got one, of course — I tried to resist as long as I could, but the fact was, in any zone without flying that had any significant bodies of water in it, the Water Strider was simply the only real option. I’m almost more excited about being able to do waterwalking on any mount than I am about getting Flying, which will also be included in Mechagon and Nazjatar as soon as it’s unlocked. That’s of course not the only feature coming in patch 8.2. It’s simply my vote for the best feature. But there’s going to be two big open world zones, Nazjatar and Mechagon, there will be Heroic Warfronts, upgrades to the Heart of Azeroth, there’s a lot going on this patch. So let’s talk about what you’re most looking forward to — are you excited about the new traits for the Heart? Epic Battlegrounds like Ashran being added to the rotation? Heritage Armor for your Gnome or Tauren characters? 8.2 is shaping up to be a pretty big patch, all told. We haven’t even talked about the Azshara raid or the Mechagon mega-dungeon, both of which will also be coming in this patch. There’s a lot to do, so let us know what you’re most looking forward to in the upcoming patch.